A long sand beach with boardwalk and expansive open water. Rocky on parts of the shoreline and in the water, where cormorants, geese and ducks perch on the rocks. The picturesque Leuty Lifeguard Station sits at a rocky inlet at the western end. E coli count 172ppm when we were there. This is a very pebbly beach. The sand is coarse, with little rocks throughout, on the shore and in the water. Not difficult to walk, but unpleasant. Lifeguards said the temp at 9 a.m. was 16°C. Other beaches we visited were also that cool early in the day, so we presume that by afternoon this one got up to 20° like the others. The water has green particles and some clumps of whatever that mossy stuff is that grows on the rocks. Large rocks on the eastern side of the beach make swimming hazardous. Farther from the rocks the water is clearer and without impediments. On previous occasions these lifeguards have distinguished themselves as the most obtrusive. Following closely in their dinghy, admonishing us to stay within the buoys (we were), directing us into the shore near the rocks… one even intruded into our conversation when we were talking about another beach she was familiar with. Altogether far too present. Looking straight at the lake from the beach, unobstructed sky and water as far as we can see. To the west, a distant downtown skyline with the CN Tower. The tall chimney stack of the Ashbridges Bay Sewage Treatment Plant is a much nearer tower. 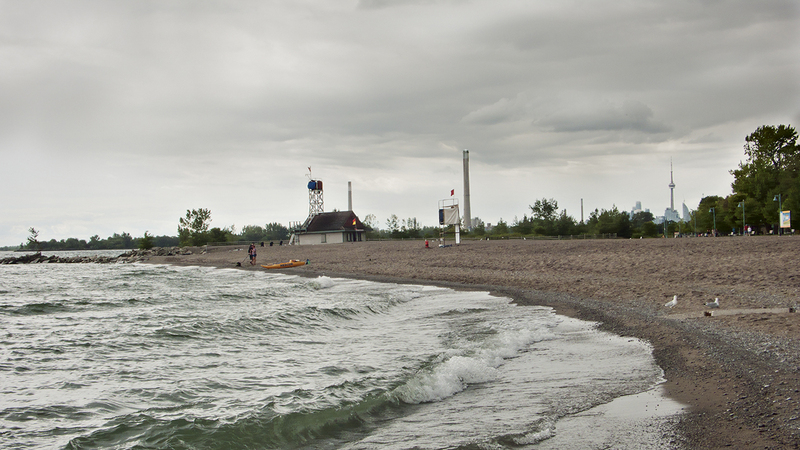 There is a large and well-used off-leash area between Kew-Balmy and Woodbine beaches. We did not encounter dogs on the swimming beach.